Discussion in 'Map Factory' started by uoz, Jul 27, 2009. I'd like to give you some information about my new work, a CTF level for Team Fortress 2, named BaldEgg. The map is being privately testing right now and it'll be released on September. You can find screenshots from the current version and further info at a mini site I created for the occasion. This map looks EXCELLENT! The mini-site has a ton of interesting images and I especially loved the signs you had, very funny stuff! Agreed. I cannot wait to play this map! I look at the art style outside and all I think is "generic custom TF2 map". The outside is very uninspired. Btw, if we credit you in the readme/anywhere possible, could we useany of thhose signs? 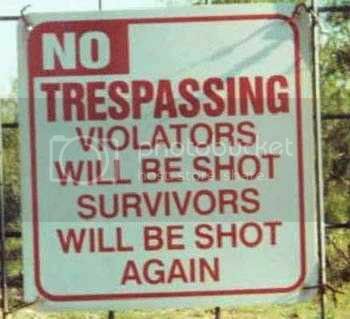 I've seen the trespassers sign before, not the stones one, but excellent, thanks. Btw the second picture, the building on the left looks a building plain. Maybe add some more trim or windows?